With Isle of Wight skaters back home after the long trip to Dumfries for the 2013 Trophy D’Ecosse, it’s worth reflecting on not just theirs but others’ achievements at the event. 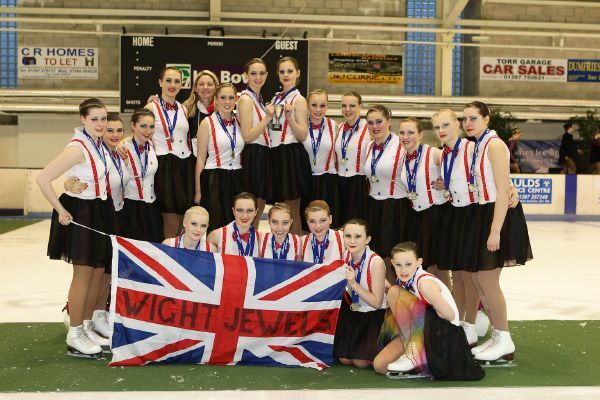 For Wight Jewels, particularly the members of the squad that are retiring this year, it was a fantastic end to a season: the best overall score by a British junior team at an ISU event all season, and the team’s first ever gold at an ISU event. In fact, the team’s first ever ISU medal. Wight Crystals achieved a season’s best and again gold at basic novice, which will hopefully help give the young team the confidence it needs to advance next season. And Wight Sparkles improved a place at elementary level, taking silver this year against last year’s bronze. Two golds and a silver no doubt made the troubled journey north well worth the effort. The journey was worthwhile for Gosport, the other Solent-based club at the event. Gosport Shooting Stars took gold in the mixed age (non-ISU) event on the Sunday. Gosport skater Amy World was particularly busy at Dumfries, skating not only for the Gosport teams but also for the Isle of Wight, where she also trains: she capped it off by returning south to compete in the level 5 ladies at the Southern Open IJS at Lee Valley today. There were tears too, most notably from iowskaters’ point of view at the rinkside, from Bracknell Fusion at elementary level. Scoring 16.39 after skating second, with Solway Lightning clearly ahead on 26.00, the team anxiously awaited the result of the remaining three teams to skate – and burst into tears after first Solihull’s Dominos and then Stirling’s Starlight Blizzard posted 15.89 and 15.69 respectively, guaranteeing Fusion a podium place. The fact that Wight Sparkles pushed them into third didn’t diminish their joy one bit. The Fusion teams did well in the medals, taking not just bronze in the elementary group, but also silver in the adults and preliminary events. An exciting taste of what is to come in British synchro was provided by new Nottingham team Ice Pops, who blitzed the juvenile group, scoring 26.25, ahead of Basingstoke’s Snowstorm on 23.10 and Aberdeen’s Topaz on 22.90. Ice Pops skated a full team of 16, with three reserves, and looked polished for a comparatively recently formed team. They demonstrated not just the skill of the young skaters but the fearsome potential of Nottingham’s academy system in years to come, if that many young skaters can stick together and push onwards to novice level and above. The Nottingham coaches were clearly and deservedly delighted with the Pops’ performance. Nottingham’s dominance also showed in the Intermediate 1 group, where Rocking Robins finished top on 29.40, ahead of Northern Lights of Inverness on 26.78 and Aberdeen’s Azura on 21.67. As far as thrills go, the teams in the ISU senior event provided plenty, with a close finish. Aberdeen’s Zariba, the British champions, led Team Spirit of Wales & West by 22.15 to 19.40 after the short. But Spirit almost closed the gap: they won the free skating section with 46.86 against Zariba’s 44.73, and finished on 66.26 against Zariba’s 66.88. Spirit scored 53.29 at their last ISU event, Zagreb Snowflakes in Croatia (28 February to 1 March). There was also a chance to talk to some delightful skaters from South Africa’s Team Silhouette, and discover something about synchronized skating in that country: not only do they suffer the usual shortage of training time, but also of opponents. The Trophy D’Ecosse was one of their few chances to compete, and they came away with bronze in the ISU advanced novice group. It was sad to see Netherlands team Duke Town Twinkle Stars only in the Intermediate 2 category: for the past few years the team has competed at junior level, but a shortage of skaters of the right age means it is unable to do so this year. The team came away with silver, scoring 27.93. The event was very much a “point whoop!” competition, with the decimal places of teams’ scores drowned out by cheers as the first digits alone confirmed victory, a personal best or a podium place. Moments like that make a competition.